We’ve all been enjoying the sunshine today – I hope it’s shining where you are! It’s been a while since I’ve posted here – life is always so busy, what with new books to get out, school visits and all of the marketing tasks I have to keep up with. However, I promised to keep you up to date with what I’m doing and wanted to share two pieces of children’s books news – and to remind you about the World Cup! Firstly, I have a new rhyming picture book out for ages 3-5+ Ferdinand Fox and the Hedgehog which introduces Hatty the hedgehog and her baby son Ed. It’s already proving extremely popular with children, parents and grandparents and the rhyming story comes with eight pages of hedgehog and fox photos and facts to share with little ones – including how we can all help hedgehogs survive. If you have children or grandchildren in this age range, do take a look at the online reviews on Amazon UK . It’s also available in the Amazon.com store and all other stores worldwide. You can also order it at your local bookshop. I took the story along to the Barnes Children’s Literature Festival the weekend before last where it was a huge hit with little ones! The beautiful Isabella Plantation woodland in Richmond Park near London (where Henry VIII used to ride out) is in full bloom right now – see my images below from a visit last week – it’s where we used to take our boys to play when they were small. 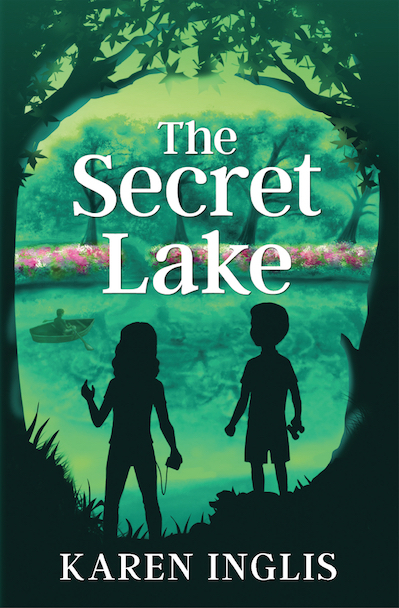 To coincide with the season, I’ve recently updated the cover of my best selling time travel adventure The Secret Lake, which was partly inspired by a magical pond at Isabella, called ‘Still Pond’. I asked for children’s votes on the cover at eight schools during my World Book Day visits in March this year and they overwhelmingly went for this one over a couple of other options – I hope you like it! I wanted to bring it up to date but also retain the classic feel that the story has, and I think my illustrator, Damir, has achieved this. You can read its many reviews on Amazon UK here. And more reviews on Amazon.com here. A match made in heaven for soccer fans 7-10 yrs! Finally, one thing I love about being an author is getting involved with community projects, or doing what I can to help with fundraising relating to literacy. Below you can see me at Brandlehow Primary School in Putney a couple of weeks ago, close to where I live in London. The PTA is raising funds for a new library and asked a few local authors if we’d come and run some free workshops that both children and parents could attend. The money they raised through donations is going towards the library, and stood at over £700 when I last heard! The children also got to buy signed books, so everyone went home happy. My next task for today is to drop off a signed copy of each of my books for prizes in a fundraising quiz being held this week at Greenmead Primary, a special needs primary school in south-west London for children aged 2-11. That’s it for now – I’ll be in touch again, but not too often. In the meantime I hope you have a great rest of week – and let’s hope the sun stays shining in the UK for our upcoming bank holiday! This entry was posted in Blog post, Children's Books, Picture Books, Reluctant readers, rhyming story, Uncategorized and tagged children's stories, karen inglis, picture books, Reluctant readers, World Cup. Bookmark the permalink.